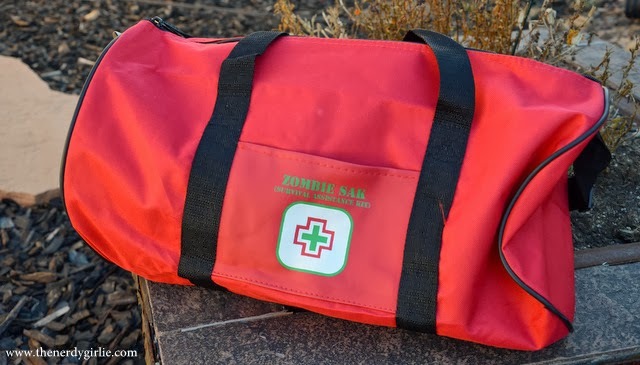 Zombie Sak is a company that provides you with the survival materials needed to get you through any disaster situation. So when they contacted me to review one of their bags, I jumped at the chance. 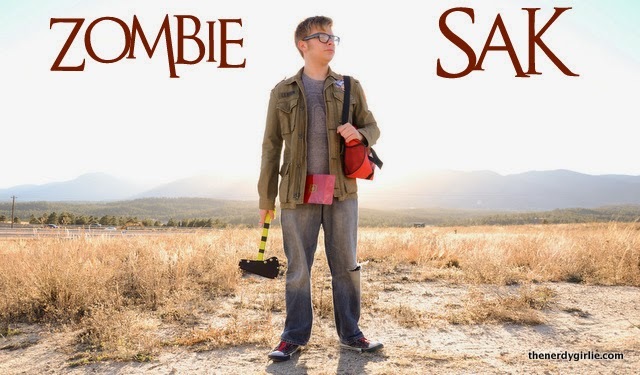 The Gamer Geek was ecstatic since he is a zombie lover in the first place. We had a great time going through the bag and doing a mock photo shoot while I was out visiting him in Colorado this past week. This Zombie Survival Kit with Ax will run you $52.95. The site has six kits to choose from running from $9.99 to $59.99. If you rather only a few things, the site also sells individual knives, food, first aid kits and other survival tools. This tomahawk alone makes this kit worth it's price. It is super sharp and heavy. I am personally going to keep this in my car, just in case of emergencies. This kit comes complete with so many great things that you can use before or after the zombie apocalypse. The Gamer Geek said that the food was less than desirable, but if you were in a life or death situation, he said he would be happy to eat them! Are you ready for a survival situation, if it ever arose? Let us know in the comments what you are doing to prepare for a disaster!